“At this first visit of mine to you, beloved brethren, the words come to my mind said by the Lord at one time through the Prophet Hosea, ‘I will say to them who were not my people, Thou art my people’…… I left the beloved motherland, my elderly mother, people familiar and close to me, those who are dear to my heart, and departed to a faraway land—to you, people not familiar to me so that from now on you become my people and my beloved ones." With these words one of the youngest bishops of the Orthodox Church of Russia greeted his new flock in America. Consecrated bishop at the young age of 32, he was assigned to the Russian Orthodox missionary diocese of America in 1898. 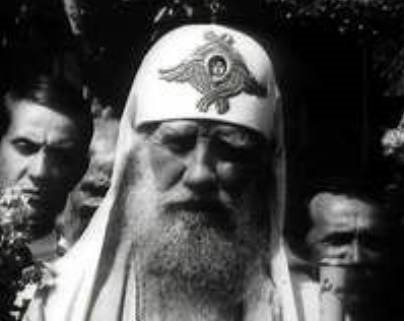 Bishop Tikhon, later Patriarch Tikhon of Russia, one of the most important Orthodox leaders of the 20th century, faithfully served the Lord in America and ended his life enduring severe persecution by the Communists in Russia. The details of his early life are unremarkable and not at all unusual. St. Tikhon was born with the name Vasily Belavin in 1865, the son of priest in a small village in Russia. He graduated from the Pskov seminary, then from the advanced theological academy in St. Petersburg followed by tonsure as a monk with the name “Tikhon” at the age of 26. After short time as a seminary professor and administrator he was consecrated bishop in 1897 briefly serving as a vicar or assistant bishop. Aside from these details of his early life, of special interest to us are the two defining periods of his life: his American ministry and his ministry as the Patriarch of Russia during the dark days of the Russian Revolution and the rise of the militantly atheistic Bolsheviks. 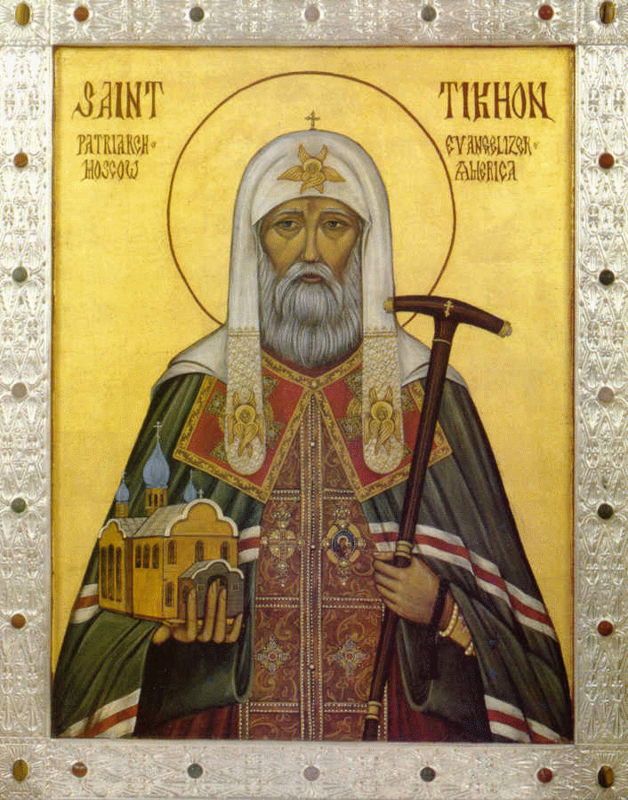 Bishop Tikhon arrived at his cathedral in San Francisco and the “Diocese of the Aleutians and Alaska” as it was then known, taking up the episcopal see once held by the illustrious St. Innocent Veniaminov – Apostle of America. Recognizing that the growth of his new Diocese was in the “lower 48” the name of the diocese was changed to “Diocese of the Aleutians and North America”. He began traveling the vast distance of his new diocese from Canada to New York, Texas to California and Alaska, visiting, encouraging and nurturing newly founded Orthodox parishes. As the only Orthodox bishop at that time in America his flock consisted of Russians, Serbs, Carpatho-Russians, Greeks, Arabs and members of native Alaskan tribes. Recognizing the unity of all Orthodox people regardless of ethnic descent he established separate vicariates one for Arabs in New York led by Bishop Raphael Hawaweeny (since canonized as St. Raphael) and one for Serbs in Chicago led by Father Sebastian Dabovich (since canonized as St. Sebastian). A seminary to train American priests was established in Minneapolis and the first monastery in America in South Canaan, Pennsylvania. The number of parishes increased from fifteen to over seventy including many who were led out of the Unia to their ancestral Orthodox Faith. With the explosive growth of the Diocese in the eastern United States, the Diocesan see was moved from San Francisco to New York City and a new cathedral was constructed – St. Nicholas on 97th Street in Manhattan. His ministry in America was not only fruitful for the Orthodox people but for himself personally. For the first time in his life he was exposed to a diverse society composed of peoples of multiple languages, races, ethnicities and religions requiring a new style of pastoral ministry from that typical in Russia. In Russia, the Church functioned almost as a department of state overseen by the Tsar. Here in America he recognized a new path was needed for the Church: a collaborative one that included lay people with clergy in overseeing and being responsible for the work of the Church, highly unusual for the time. Using the ancient model of councils and synods the Diocese convened the first Sobor or Council of the American Diocese with clergy and lay delegates meeting in Mayfield, Pennsylvania in 1907. Your news about my election for the Patriarchate is to me that scroll on which was written: “Weeping, sighing, and sorrow” which scroll had to be eaten by the prophet Ezekiel (2:10; 3:1) How many tears will I have to swallow or how many sighs emit in my forthcoming Patriarchal office and especially in the present woeful time. 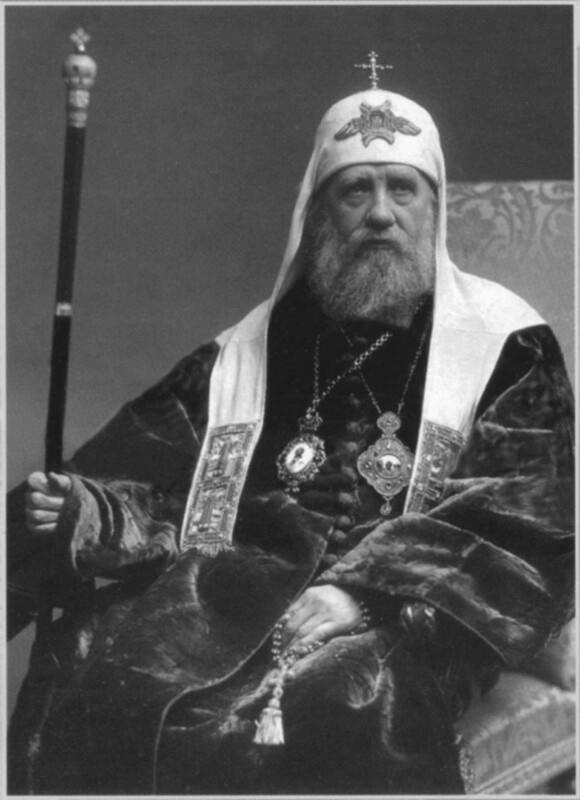 He instructed his priests: “Devote all your energy to preaching the word of God and the truth of Christ, especially today, when unbelief and atheism are audaciously attacking the Church of Christ.” The Bolsheviks responded by placing the Patriarch first under house arrest and then in the dreaded Lubyanka prison. The government had pronounced a death sentence against him and was ready to place him before a firing squad except that word of his arrest reached the West and caused an outcry from Western governments and churches. He was attacked and stabbed by an insane woman while leaving his cathedral in 1919 but only slightly wounded. A second attempt on his life occurred in 1924 when unknown assailants broke into his apartment and killed his personal assistant while Tikhon was praying in the next room. How did Tikhon react to all that he endured? One of the Red Army soldiers assigned to guard him during his house arrest recalled “The old man is good to everyone, only he prays all night and we can’t sleep”. Worn down from years of harassment and persecution, the Patriarch’s health began to decline in 1924. On Sunday, April 5, 1925 he celebrated his last Divine Liturgy before entering the hospital. He died on April 7, 1925 shortly after making the Sign of the Cross and saying “Glory to Thee, O Lord, glory to Thee”. To this day it is suspected that he had been poisoned and did not succumb from a heart attack as noted in the official reports. While the actual cause of his death cannot be proven, he deserves the title of “Confessor of the Faith”; that is, one who suffered for Christ. He was numbered among the saints by the Council of Bishops of the Orthodox Church of Russia in 1989. 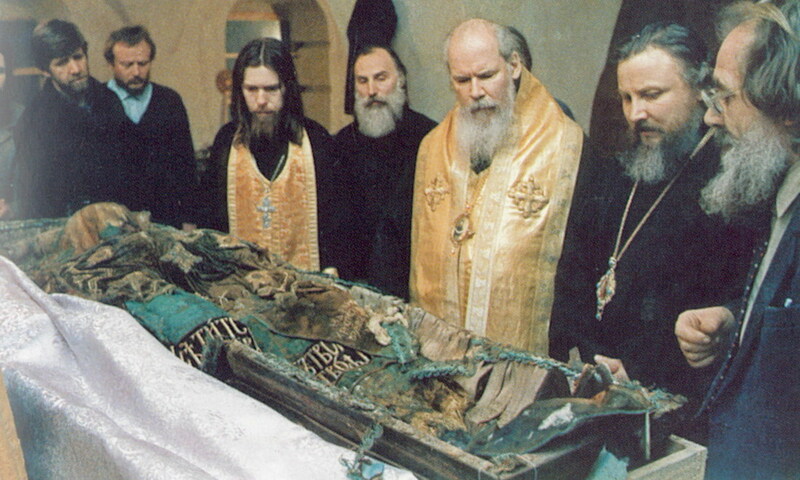 Following his burial in the Donskoy Monastery his relics were lost, having been at some point hidden to prevent their destruction by the Communists. Their hatred of him was so great that in a “list of enemies of Soviet authority” published in a newspaper, his name was first. In 1992 during repair work on the church following a fire, his incorrupt holy relics were discovered hidden beneath the floor.